I have a love-hate relationship with subscription/collaboration boxes. On one hand, lots of makers use them to try out ingredients they only have a limited quantity of, or try making something splashy far outside their typical comfort zone, and the results can be stunning. On the other hand, I've never yet come across one of these boxes that I just had to have more than one or two of the polishes, so I end up scrounging for the special one in the secondary market later. Continuing both my Cadillacquer untrieds and my neutral/traditional color following a bold one, today i have Winston, also from the Eat the Rude (Hannibal) collection. Winston, named for the main character of the show's shaggy dog, is a grey-leaning taupe with Cadillacquer's signature loosely linear/tightly scattered holo, and an interesting flash of blue courtesy of some microflake shimmer. This is a warm or putty type of taupe (debatably grey) that's cooled down interestingly by the blue flash. Same typically creamy formula from Cadillacquer, with the propensity to stay only where you put it, minimizing necessary clean-up. The holo sparkle is both pretty and subtle, far more integrated than in-your-face, as typical for this maker. I only have a few Cadillacquers left in my untried pile, and conveniently, one's a dark and dramatic color while the other is a modern neutral, so my alternates game can continue if I go through them both. Wolf Trap, from the recent Eat the Rude collection inspired by Hannibal (we loved this show at my house!!) is first up. Wolf Trap (named for the region in Virginia that the show's main character lives in) is a rich hunter green with the same loosely linear/sparkly scattered holo that I'm now convinced is very much Cadillacquer's calling card. 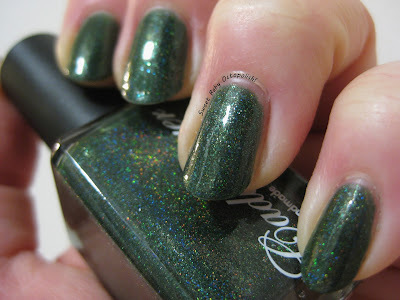 It additionally has some blue-tinged green microflake shimmer that adds interest in lower lighting. I realized after a couple days of wearing Wolf Trap that it wasn't my solo dark green holo, so here's a quick swatch-stick comparison. Continuing my back-and-forth of dramatic vampy winter colors alternating with neutrals, today I have Cadillacquer's A Dragon is Not a Slave, from their 2015 GOT collection. The lovely bronze-copper flash on the edge of the bottle and down the middle of the nail is not at all a trick of the light - this is absolutely how Dragon rolls. We have here a warm, taupe-y grey with a delicate linear holo and plenty of fiery shimmer. The shimmer is subtly duochromatic, appearing more reddish coppery directly, and more golden bronze at angles. The holo here, as with both of the other Cadillacquer polishes I've tried, is what some people call "scattered linear," not the sort with a blinding holo flame. The very fine refractive particles create sort of a light dusting of rainbow. The overall effect is of a smouldering fire within smoky ashes, and it's a fantastic color. Continuing her reign as greatest polish enabler of all time, Suzy alerted me several weeks ago to an upcoming Enchanted Polish restock, which included the launch of their new collaboration shade with iparallaxe, Neptune. UNFF. Just look at that color. Suzy wins life/the interwebs/etc. Neptune is utterly gorgeous in the bottle - a richly saturated, deep teal, sparkling with holo microglitters, that has a fantastic royal purple shift. It's got a rather jelly-like formula that gets sticky in between coats and makes it challenging to wrap your tips without them getting too thick, but the shine was perfect even before topcoat, and it was nicely evened out at 2-3 coats. But OMG is it worth any application troubles! The tiny little holo glitters spread out to a nicely even distribution, the thickness of the jelly base means there's no pooling in the cuticles, and sweet baby octopus that color! Apparently, my pendulum is going to swing with each mani from a light color to a vampy one. Maybe that's my new deal this year: office appropriate then crazy each week? Who knows?! Girly Bits Eggnogoholic was from a holiday collection (of course, given the name) from a couple of years ago. It's a barely off-white color that my grandmother would have called "almond," and it's in a translucent crelly finish that gets a lovely shine with one layer of topcoat. VNL was certainly happening in all lighting conditions, but in that delicately feminine way that I think is pretty and not a flaw. I'm wearing 2 coats here, but I'm not really sure you'd get to opacity even with 4. 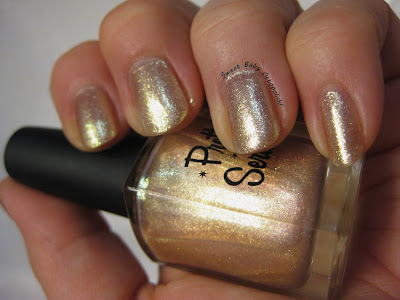 After my light, pretty gold, the vampy shades of winter reasserted themselves, and I was reminded I'd paid crazy shipping costs to get this single bottle of polish exported from Singapore: Femme Fatale's Sideshow Sparkler. Sideshow Sparkler is a deep blue-tinged purple jelly, packed with a dark emerald green shimmer and scattered with holo microglitters in a rainbow of fruit flavors. Both opacity and depth of the shimmer are achieved at 3 coats. This polish was plenty sparkly and did an amazing job of catching any flash of light around, but it was surprisingly topcoat hungry, and I think I really needed more than the single layer I used to make this shine properly. You can see the little holo flashes in the brighter pic above, while the various colors of the glitters are shown below. I was away on a lovely (and long overdue!) vacation mid-December, and my Pretty Serious haul had just arrived when it was time to pick a few bottles to pack up with me. Sparkly Mummy Mush caught my eye immediately and was the first thing I put on. It wore like IRON, looking flawless a week later. I just had to repeat this one for my New Year's Eve mani.